Nobody likes Westerns, so why are so many new ones  backed by big studios and big stars  arriving in movie theaters this fall? 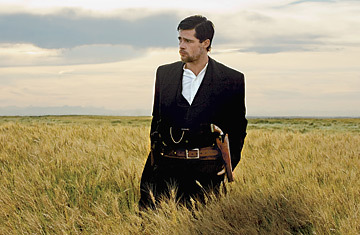 Kimblery French / Warner Bros.
Brad Pitt stars as Jesse James in The Assassination of Jesse James by the Coward Robert Ford. In The Assassination of Jesse James by the Coward Robert Ford, Bob Ford (Casey Affleck) is a soulful young punk who wants to join up with Jesse (Brad Pitt) and his outlaw gang, whose exploits have made them notorious throughout the burgeoning West of the 1870s. Bob has read all the dime novels about Jesse and wants to rob his way into infamy. But the gang is breaking down from envy and exhaustion--and from the natural rancor of ornery, armed men. Bob is too late for the party; he's just in time for the funeral.